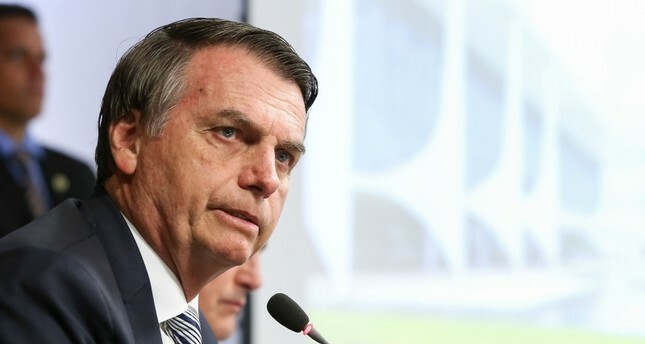 Brazil President Jair Bolsonaro had a fever and possible pneumonia, his doctors said Thursday, 10 days after the far-right leader underwent surgery on the stomach wound he suffered when stabbed last year. The 63-year-old remains in semi-intensive care in Sao Paulo following a procedure to remove his colostomy bag and reconnect the bowel. "Last night he had a fever (and) was subjected to a CT scan of the chest and abdomen that showed good intestinal evolution" as well as "an image consistent with pneumonia," Bolsonaro's doctors said in their daily medical bulletin. The president's spokesman, Otavio do Rego Barros, said the image "confirmed the possibility of pneumonia" but added that doctors "didn't seem more worried" than before. "Beware of sensationalism," said Bolsonaro in a tweet, while he held up his thumb in a picture also posted to Twitter. The former army captain is a prolific user of social media, where he conducted large portions of his successful presidential campaign last year. "We're very calm, well and we're staying the course," he wrote. Bolsonaro's sons have also been active on social media, posting positive updates on their father's health. The president was due to leave hospital this week but still hasn't resumed eating normally and continues to be fed intravenously. He underwent an operation on January 28, his third since the knife attack, to reconnect his bowel so he could resume natural waste evacuation. It took twice as long as the three to four hours expected due to a number of complications. Since then he's had several fevers as well as suffered from nausea and vomiting, and has been fitted with a nasogastric tube, a drain and has been given antibiotics. Officially, Bolsonaro has continued to run the country from his hospital bed.